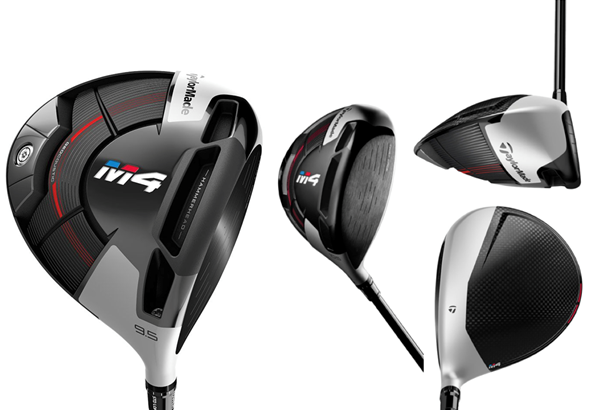 TaylorMade M4 Driver: The new TaylorMade driver is packed with brand new technology and an emphasis on forgiveness. Lofts: 8.5°, 9.5°, 10.5° & 12°; LH in 9.5° and 10.5°. Shafts: Fujikura Atmos Red shaft in 6X, 5S, 5R, 5A (Matrix Platinum White Tie in D-Type). 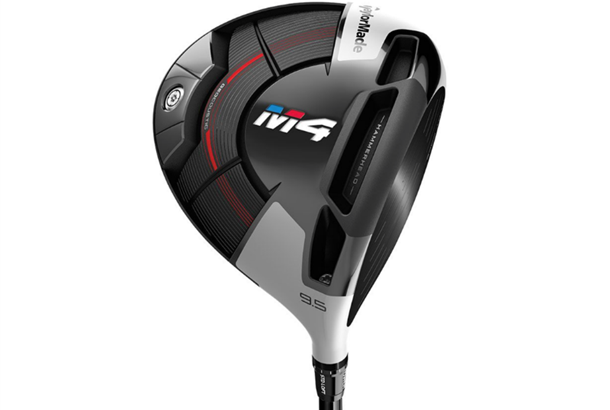 The new TaylorMade M4 Driver is packed with technology, but differentiates its design from the M3 driver by putting a larger emphasis on unparalleled forgiveness with straight distance. 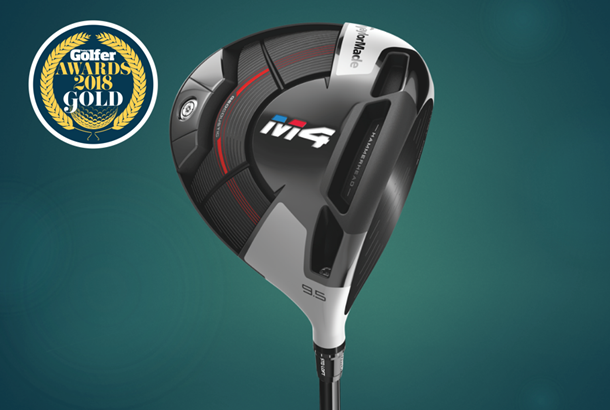 The M4 driver not only utilizes TaylorMade’s most groundbreaking 2018 technologies (Twist Face & Hammerhead slot), but it also incorporates Geocoustic engineering – which combines geometry and acoustical engineering to unlock more forgiveness and a better sound. With a new composite crown and a lighter and thinner face, the new TaylorMade M4 driver is much more aeordynamic and boasts the thinnest, strongest and lightest composite panels in the industry that TaylorMade have ever created. Brian Bazzel, VP of Product Design, said: "The driver has a beautiful new sole design, different than the M3 as you don’t see as much of the carbon fibre. As you rotate you will see the geocoustic sole sunken in there, a big weight in the back. That raised carbon fibre crown is for aerodynamics, twist face and hammerhead." "Golfers that buy an M4 – they want to hit it farther, they want to hit it straighter and they maybe don’t have the mind-set to get in to the adjustability and personalisation. It’s a little bit more simplified [than the M3]"
All the same Twist Face and Hammerhead tech as the M3 but with 41g (up from 22g in the M2) of weight positioned in the rear weight pad to max out forgiveness. Geocoustic engineering means the recessed sole frees up volume (to create a bigger more forgiving footprint) and produces higher frequencies to sound and feel better. A five-layer carbon crown and matte silver paintjob give an indisputably TaylorMade look. 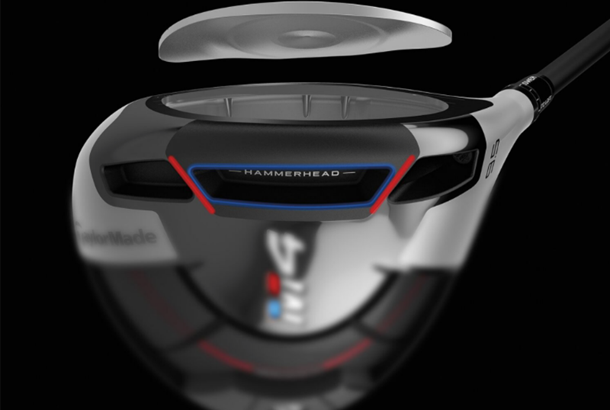 TaylorMade’s new Twist Face tech has commanded tons of column inches and You Tube videos views, but the first thing you’ve got to realise is the M4s face (like the M3s) is nowhere near as twisted as the graphics you’ve seen. Sit the M4 down alongside an M2 and the untrained eye will struggle to spot the difference, which trust us is a really good thing. All three testers found M4 generated higher levels of backspin, which is likely down to 41g of mass being located so far back in the head, meaning it’s well worth your time to select a shaft carefully as our test pro picked up 13 yards of carry distance by finding a good match. World #1 Dustin Johnson won on his first tournament outing of 2018 with an M4 in his bag, giving the club instant tour validation. It produced very solid distance and forgiveness numbers for our testers without quite topping the pile. Experience tells us along with the Callaway Rogue and Ping G400 MAX it will be amongst the best-selling drivers of 2018. 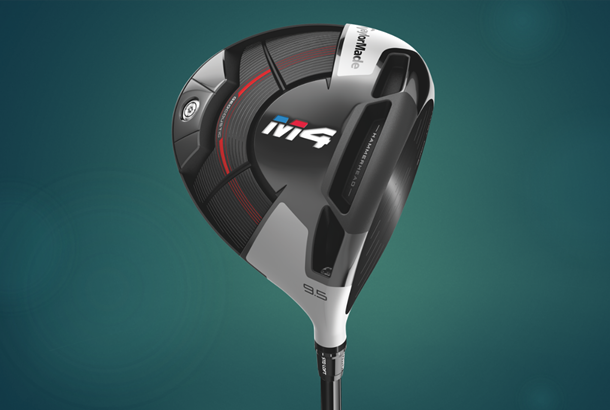 The new TaylorMade M4 Driver uses the brands new innovative face design technology 'Twist Face', which in its simplest form has been created to achieve longer, straighter shots for the golfer. Both the TaylorMade M3 driver and TaylorMade M4 driver have Twist Face technology, where the high toe has been ‘twisted’ open and the low heel closed with less loft to help correct the face angle for golfers biggest misses. It was engineered to work in combination with Twist Face and Inverted Cone tech to deliver max ball speed across a larger area of the face. By dividing the Speed Pocket into zones, TaylorMade was able to increase its overall length in the new M4 driver from 82mm to 100mm – a 22% increase. Additionally, it allowed for the creation of a larger flexible centre zone, designed to increase ball speed on low face impacts and drop unwanted backspin. By using the new ribs at enther end of the slot, engineers were able to decrease the thickness and weight allowing for a more flexible face. Driver heads with low/back centre of gravity locations typically have low frequencies because they tend to have fairly flat soles. The new TaylorMade M4 driver's Geocoustic sole shape allows for a low CG and larger head size, but with a more curved sole which has inherently higher frequencies, leading to better sound and feel. The Geocoustic sole design of the M4 driver freed up discretionary volume that allowed engineers to increase the overall face size and also improved sound and feel. "We’ve sunken in that sole section – it’s more curved which allows us to stiffen it and create better sound and acoustics and by curving it it allows us to take a lot of the rib structures inside the head away, which weight we can take and put it in the back section to increase inertia. The footprint of M3 and M4, when you set it down, are identical; the difference is that the M4 face is slightly larger because we freed up a couple of CCs from the geocoustic sole and allowed us to make the face a bit bigger and is still considered 460cc." 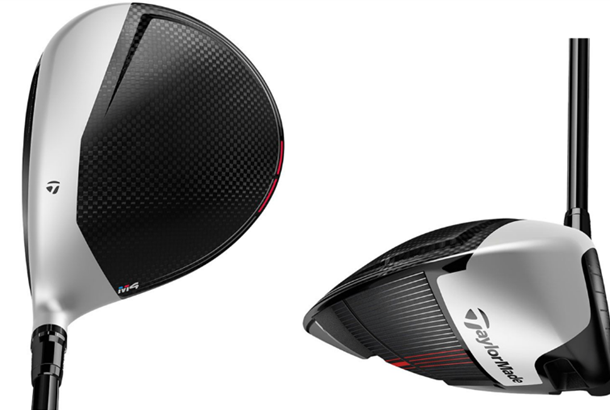 The new M4 TaylorMade driver (like the TaylorMade M3 driver) features a new matte silver front section and a raised, aerodynamic five-layer carbon composite crown. Years of research and development have culminated in the thinnest, strongest and lightest composite panels in the industry that TaylorMade have ever created. The top crown (the raised section) is where the aerodynamics plays the biggest role, and is aimed to help you as you come through your downswing as that’s where you’re picking up speed. TaylorMade wanted to keep the flow attached as long as possible so to do that they built in a high crown for that angled plane of your downswing. By casting it in a 5-layer carbon and raising it up they haven't really raised the CG up at all but keep the air-flow attached longer. They also didn’t want to make the club look upright so the front section is flattened (almost like 2016 M1/M2) but were able to raise it with the carbon and improve aerodynamics. 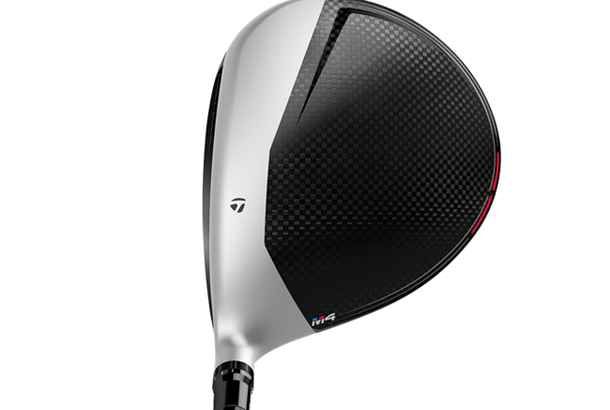 Also new to the Taylormade M4 driver is a redesigned face that is both thinner and lighter. The maximum thickness has been reduced from 4.47mm to 3.6mm and the heel/toe perimeter thickness has been reduced from 2mm to 1.92mm. In addition, the mass of the face has been reduced from 45.5g in the ’17 M2 to 37.6g – 17.3%. "The sweetspot is increasing because the inertia is going up and partly because of the hammerhead slot and the ability to make our face thinner, lighter and more flexible. That face is 8g lighter than M2, and in the back of that head there is 40g of weight as opposed to todays M2 which is 22g up there, part of that because of the face, part of that because of the way we have cast the head in the sole. " Last year’s TaylorMade D-Type M2 was one of our favourite drivers, featuring slice-busting tech in a head that didn’t scream “I’m a slicer!”. The new TaylorMade M4 D-Type (D means draw) has all the tech of the normal version, but is more heel-weighted (41g), has a slight offset and uses subtle visual cues to promote a square face at address and a more draw-biased face at impact. "Last year we introduced the D-Type. 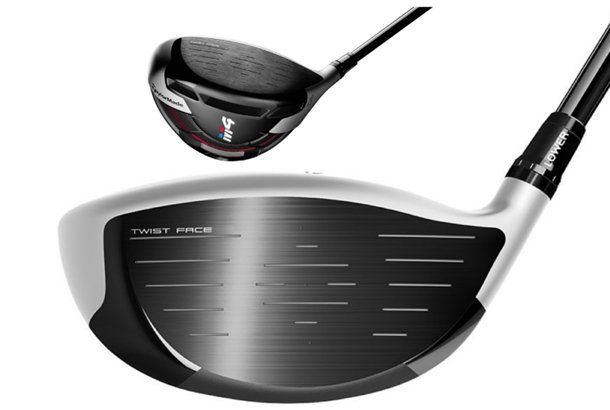 By moving 40g of weight in to the heel and peeling the matte silver on the face back but keeping it closed, allows us 20 yards more left-bias than the standard M4, which brings them from off the golf course to on the golf course – and that’s when twist-face takes over."